Why choose Beyond Limits Adventures? Beyond Limits is chosen by Trip Advisor as the #1 Whitewater Rafting trip in California and the #8 Whitewater Rafting trip in the US! Videos and Photos of your trip! We provide Go Pro cameras for all of our trips so you can capture the fun and view the action after the trip! A professional kayak photographer also captures photos of most trips. Video and photo files may be purchased in our river store after your trip. We play on the river! No other rafting company has the skilled guides that we do. If you have an adventurous group we'll show you all the tricks... including surfing, ramp rocks, riding the bull and other fun stuff that other companies won't. Flexibility for groups - We're a small company so we can personalize any trip for your group. Whether you have a scout group or a bachelor party for the guys, we'll customize our trips just for you. Group Planning Experts!- If you are shopping around for a group event, we will quote you a special group price. We'll even hold the space open for you, with no payment. We then email you a reservation number and so everyone in your group can pay for their spots online, for the group discounted rate! Competitive prices, family rates and very generous group discounts. Early and late season discounts. State of the art equipment. We were the first company in the country to use self-bailing SOTAR rafts on every trip...the best boats on the water and made in the USA. Unbelievable Facilities! 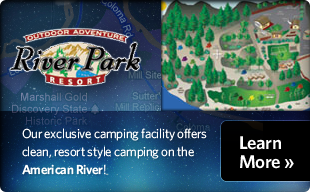 We own our own camp on the American River and we're proud to have one of the nicest rafting resorts in the western US. No other rafting company can offer the trips and packages that we can - come visit us and you'll understand why! Paddle boats. We have many different sized boats, suitable for every type of water. Our guides are some of the most experienced paddle captains on the river. They know all the tricks to make our trips fun for all ages! Food prepared fresh every day. Rafters have big appetites and our food won't leave you hungry! Our meals are all freshly prepared and buffet style, with all the fixins.. as they say on the river! Outstanding Safety Record. Since 1980 we've been rafting the most challenging rivers through the world. Our experience from all those years results in the highest safety standards in the industry. Our guides, equipment and training all have safety as our number one priority! And above all - our Staff -Our office staff, guides and drivers are all personable, professional and fun to be around. Our highly skilled guides are always requested by our return guests and they love to show you a good time on the river!!! Just want to say thank you for a great day! You made my birthday fantastic and mike our guide was so Much fun. We will definitely be back.